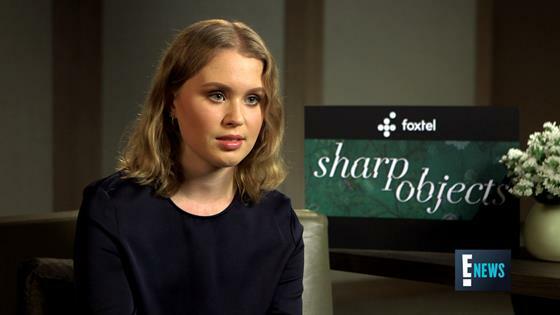 Eliza Scanlen grew up watching Amy Adams in her favourite films and now shares the screen with the ­star. The 19-year-old Australian actress appears alongside the five-time Academy Award nominee, plus Patricia Clarkson and Chris Messina, in HBO's dark new miniseries Sharp Objects. "I was a big fan [of Amy] from a young age because of Enchanted. My sister and I were quite big fans of the movie, and of course American Hustle was one of her really great films that was quite recent," she tells E! News while in Sydney. "It was surreal to meet her for the first time. But she has this lovely maternal instinct about her that made it easy to slip into that atmosphere." Eliza plays 15-year-old Amma Crellin, the troubled half-sister of reporter Camille Preaker (Amy), who returns to her hometown to investigate the murder of one girl and the disappearance of another. Although the former Home and Away star has been acting since age 13 and professionally since 17, the miniseries is her first international break. Luckily, her co-star was a huge support on set. "[Amy] was just so lovely to me, especially knowing this is one of the first jobs that I've had. And she really took me under her wing and she gave me a lot of advice," the Sydney-raised actress says. "She was really my rock." The series is based on the best-selling novel of the same name from Gone Girl author Gillian Flynn and directed by Jean-Marc Vallée, of Big Little Lies fame. "I did watch Big Little Lies and one of my favourite movies is Dallas Buyers Club, so I was a really big fan," Eliza tells E! News. "Jean-Marc is so incredible. He has this incredible trust in his actors to do the job. I feel so honoured to be working with him." The small-town crime thriller gets gory at times, which has been a test for Eliza. "I'm a bit of a baby, so I don't really like the gory stuff," she says. "But with this show, I think it's less about the crime itself and more about the inner workings of Camille and all of the characters. For Camille, it's not about confronting the story, it's about confronting her past and confronting her own truth, which can be frightening. I guess that's what makes this show so appealing because it's something we can all latch on to." Months on from shooting scenes in California and Georgia, the actress has stayed friendly with her co-stars. "I do keep in touch with Amy and Patricia and the two girls that play my friends on the show. We're all really close mates and we all message one another," she says. "Patricia is usually like, ‘Let's get a wine. And a few bites to eat. See you soon.' Amy's not so good at texting. She once lost her phone for a whole week, so when I do get her on the phone it's a score!" Sharp Objects airs on Mondays at 11am/8.30pm on Foxtel's showcase and is now streaming on Foxtel On Demand.